It’s started! 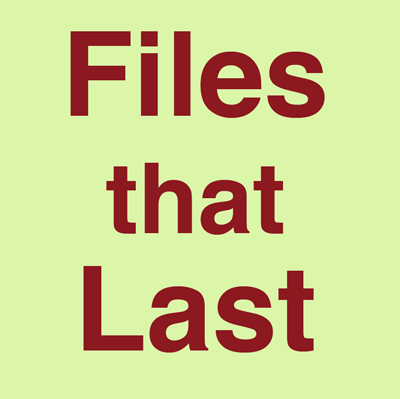 Today I’m launching a Kickstarter campaign to help fund the completion and publication of my e-book, Files That Last . Rather than repeat everything I’ve said on the Kickstarter page and the homepage for the book, I’ll say just enough to convince you, as someone who cares about formats and digital preservation, that it’s worth looking at those pages and considering helping to fund the book and spread the word. So far there isn’t, as far as I know, a book to promote and explain digital preservation to people who understand computers but aren’t part of the library and archiving world. That’s where I’m aiming this book. If you look at the Library of Congress’s personal archiving pages, that gives you some idea of what I’m aiming at, though I’m also addressing nonprofit organizations and businesses. It’s not a book for programmers, but it will have enough technical detail to give an understanding of how formats, metadata, and media affect the longevity of files and how to make best use of them. If you pledge $10, you’ll get an electronic copy of the book when it’s done (DRM-free, naturally). For just $100, you can use it as a classroom text and distribute it to up to 50 students! If you want brief, regular updates on the project, add this URL to your RSS feed. I’m counting on your support to help make this happen, whether you pledge money, spread the word, or both. I’m excited about getting the book out, and I think you will be too when you see it. This entry was posted in News and tagged books, FTL, preservation. Bookmark the permalink.